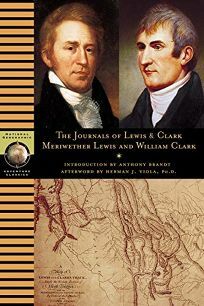 The epic Lewis and Clark Expedition comes to life on a human scale in this engrossing abridgment of the explorers' journals. The travelers spent more than two years traveling up the Missouri, across the Rockies to the Pacific and back, and these accounts leave no doubt that it was a very hard slog. Page after page details the drudgery of paddling and hauling the boats upstream, the maddening mosquitoes and the enervating damp of the Pacific Northwest; virtually every entry includes an anxious tally of the game killed that day to feed the party. But the sober, soldierly tone of the journals often gives way to lyrical descriptions of the terrain and wildlife of the magnificent landscapes through which the expedition passed (hair-raising encounters with grizzlies are a persistent refrain). Particularly intriguing are the portraits of the Indian peoples the explorers encountered, with whom they maintained mostly friendly relations. Although burdened by the prejudices of the age, Lewis and Clark recognized the complexity of the attitudes and motivations of the Indians, who wavered between wariness of white men and eagerness to trade with them and enlist their support in the convoluted inter-tribal politics of the West. The editor's assiduous untangling of the explorers' notoriously bad spelling, punctuation and grammar, helpful notes and maps and fluent synopses of the duller stretches of the narrative make the journals accessible to a general readership. In the words of Smithsonian Institution curator emeritus Herman J. Viola, who contributes an afterword, these journals are""an American classic in the truest sense.""